16:00 What is Arts Initiative Tokyo? The Frisian landEscape, Artists: Shana Moulton & Noa Giniger, 2011, Duration: 3'30"
Please join us this Wednesday for the opening of this third one-day exhibition and HALBE! Zitten is een werkwoord / Sentarse es una Acción, Rietveld voor IMPA is a project about labour, and production, and ownership, and education, and chairs. Please join us this Thursday for the opening of this one-day exhibition, HALBE and music! 16:00 DeSERVICEGARAGE in conjunction with HALBE presents: Judith Leysner and DAY RAVE by dj BABA ELECTRONICA! 16:00 DeSERVICEGARAGE in conjunction with HALBE presents: Sjoerd Tim and Isfrid Angard Siljehaug. An Improvised Choreography staged by dancer/choreographer Kenzo Kusuda and Revanta Sarabhai with musician Alfredo Genovesi. 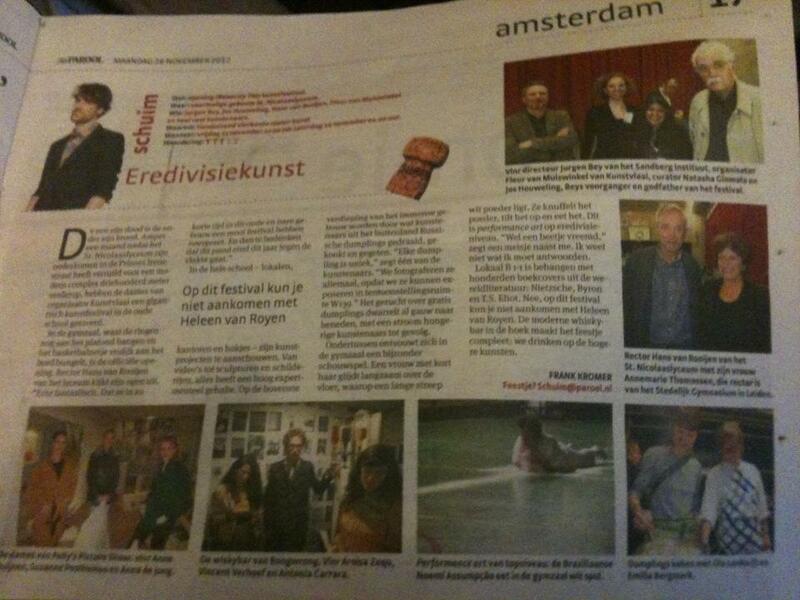 Joyce Roodnat of the NRC Handelsblad visited Rijksakademie Open and Kunstvlaai 2012. Read her report here. Folia TV visited the students of the Sandberg at the Kunstvlaai 2012. One of the Dutch initiatives of the Kunstvlaai 2012 - Baracca - made a video. Check it out. Thomas van den Oever, of Overdose.am visited the Kunstvlaai. Read his report here. Kunstvlaai: Festival of Independents is a hosting platform for over 70 local and international artist-led initiatives, art schools and nomadic organizations of the contemporary visual arts. The 2012 edition, 'INexactly THIS' is a dynamic staging of exhibitions, live arts, film screenings, archival presentations, lectures and workshops. The festival encourages qualities of speculation, collaboration and generous openness found within diverse models for self-organization, autonomous practice and the role of education in the cultural field. We are living through an inexact time – when questions become misplaced and answers fail to emerge. While the impact of social resistances, right--wing governments and capitalist meltdown is apparent in the everyday, the long—term consequences are still to unfold. Can we form a bigger picture that marks this very particular, transitional period? Art is a mechanism to ‘make sense’ of the present, while also proposing possible futures through speculative thinking, gestural readings, and even provocations. Its hybrity of forms may enable us to compose a sensible picture for our insensible times. One that is a partial, imagined constellation, and yet addresses the common urgencies before us. The new venue for Kunstvlaai 2012 edition, INexactly THIS, is the Sint Nicolaas Lyceum in Amsterdam Zuid. It is located away from the historical centre, surrounded by the lush Beatrix park and giant corporate buildings of the WTC business district. The Sint Nicolaas complex originally included the school buildings as well as a former convent and was built in the 1950s by the architects Lau Peters, Ted Peters and Ben Spängberg. Initially divided into separate Boys and Girls schools, these buildings were later combined, bringing about major architectural modifications. The Kunstvlaai was set up in 1997 by the former director of the Sandberg Institute, Jos Houweling, as a counterpart to the annual KunstRAI art fair in Amsterdam. In contrast to the art fair, the Kunstvlaai provided the smaller, independent art institutes such as artist initiatives with space to present themselves. Ever since its conception, the Kunstvlaai has been the largest exhibition of experimental and non-commercial art in the Netherlands. An average of more than 70 independent institutions take part, which together present the work of some 250 Dutch and international artists at each edition. The latest edition took place in 2010 at the Cultuurpark Westergasfabriek and attracted about 12,000 visitors. Fleur is an independent curator and Art Historian based in Amsterdam. In 2011 she completed her MFA Curating at Goldsmiths University, London. As part of the program she curated the solo exhibition “Help Young Worlds” by Ad de Jong at the artist-run gallery 1857, in Oslo (NO). Prior to her studies at Goldsmiths, Fleur worked at Office for Contemporary Art Norway as the coordinator for the International Studio program (06/09) and had completed her postgraduate study Art History at the Vrije Universiteit in Amsterdam in 2007. In 2010-11 Fleur was part of curatorial team for the symposia Actors, Agents and Attendants: Speculations on the Cultural Organization of Civility (2010) and AAA II: Social Housing – Housing the Social (2011) curated by Fulya Erdemci and Andrea Phillips. She has curated several shows and events including: Traveling into the Unknown, Amsterdam; Babette Mangolte: The Camera: Je, La Camera: I, South London Gallery, London; Untitled 2010, Pigeon Wing Gallery, London; Light Reading with Babette Mangolte, no.w.here, London and co-curated the exhibitions Live at 176, 176/Zabludowicz Collection, London and Mulberry Tree Press, SE8 Gallery, London among others. Her writing has appeared in MetropolisM, online magazines and in several artist publications. Natasha is an independent curator and art critic based in Amsterdam, where she participated in de Appel Curatorial Programme 2010/11. As part of the programme she co-curated the group exhibition Fluiten in het Donker at de Appel Boys School. Natasha has completed her postgraduate studies at The School of Arts & Aesthetics, Jawaharlal Nehru University (New Delhi) and Asian College of Journalism (Chennai). In 2008-09, she was part of the curatorial team for the exhibition Where in the World at the Devi Art Foundation and was critic-in-residence for the PEERS Residency '09 at KHOJ Studios (New Delhi). In 2012, Natasha has contributed to the Studium Generale Programme at the Rietveld Academie and taught at the Masters in Artistic Research (UvA and Sandberg Institute). She is among the co-curators of Taipei Biennial 2012 (curator, Anselm Franke) and has contributed with the segment Museum of Rhythm. Her recent writing has appeared in Afterall Online, C Magazine and TAKE on Art Magazine, amongst others. not the festival location, thank you. Unfortunately due to the fact that the building is a school and the timing it was built, the building access is limited. I.E. there is limited wheel chair access, no elevators / escalators, no handicap accessible bathrooms. the festival is only open for invitees. Avoid waiting in line at the festival and buy your ticket online now! – under the age of 7 years, guided by adult, free entry. Train 51 from Amsterdam Central Station, to Amstelveen. Exit at Amsterdam Zuid station. A 6 minute walk from Amsterdam Zuid station to the Prinses Irenestraat 21. Tram 5 from Amsterdam Central, to Amstelveen. Exit at Prinses Irenestraat/Beethovenstraat. From Amsterdam city central you bike to Amsterdam South, follow the signs Amsterdam WTC. The Prinses Irenestraat is situated at the end of the Beethovenstraat, right next tot the Beatrixpark. The biker ride takes about 7 minutes from Museumplein. From the direction of the A4 follow highway Amsterdam A10 direction South. Take the exit at Amsterdam Oud Zuid (exit S108). After 225 meter go left on De Boelelaan. After 0.8 km turn left on the Buitenveldertselaan. After 0.6 km turn right on the Strawinskylaan. After 0.6 km turn left on the Beethovenstraat. Turn right after 120 m. You have reached the Prinses Irenestraat. You can park your car in the neighborhood. Please note: you have to pay for parking. From the direction A1 or A2, follow highway Amsterdam A10 East to South in the direction of Den Haag. After 1.9 km take exit Amsterdam Rivierenbuurt / Amsterdam-Buitenveldert (exit S10). Turn left after 0.5 km on the Europaboulevard (S109) in the direction of Buitenveldert. After 350 m turn right on De Boelelaan. After 0.8 km rung right on the Beethovenstraat. After 0.8 km turn right. You have reached the Prinses Irenestraat. You can park your car in the neighborhood. Please note: you have to pay for parking. From the direction A8 or A7, follow highway Amsterdam A10 West to South. After 9.3 km at the crossroad De Nieuwe Meer, follow the A10 towards Utrecht. After 2.5 km take the Amsterdam Oud Zuid exit (exit S108). After 225 meter go left on De Boelelaan. After 0.8 km turn left on the Buitenveldertselaan. After 0.6 km turn right on the Strawinskylaan. After 0.6 km turn left on the Beethovenstraat. Turn right after 120 m. You have reached the Prinses Irenestraat. You can park your car in the neighborhood. Please note: you have to pay for parking. 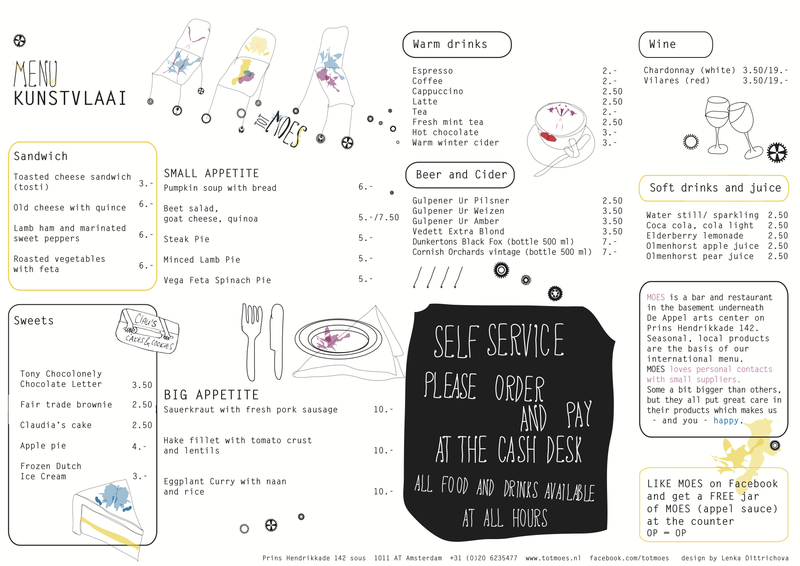 MOES eet en drinklokaal provides the food and drinks during your visit to the Kunstvlaai. MOES serves all day long warm and cold drinks and heathy, delicious and honest food for large or small appetite. You can find them, of course, in the canteen. Een frisse blik op de actualiteit? Ontmoet andere kantoren van de Zuidas met deze inspirerende Lunch Tour! Na het succes van de Lunch Tours op de Rietveld Academie afgelopen zomer biedt AimAtArt op woensdag 28, donderdag 29 en vrijdag 30 november speciale Lunch Tours op de Kunstvlaai; een 10-daags kunstfestival op de Zuidas! Op dit moment leven we in dynamische tijden vol veranderingen. De Kunstvlaai laat ons op een andere manier naar deze actualiteit kijken. Hoe kenmerkt onze tijd zich en waar gaan we naar toe? Ontdek het aan de hand van de tour van AimAtArt langs aansprekende kunstwerken en ervaar hoe kunst je ogen kan openen. Een lunch vol creativiteit, nieuwe contacten en verfrissende gesprekken. Je zit gegarandeerd vol nieuwe inzichten achter je bureau! Schrijf je in voor de Lunch Tour voor slechts €18, 50 (incl. 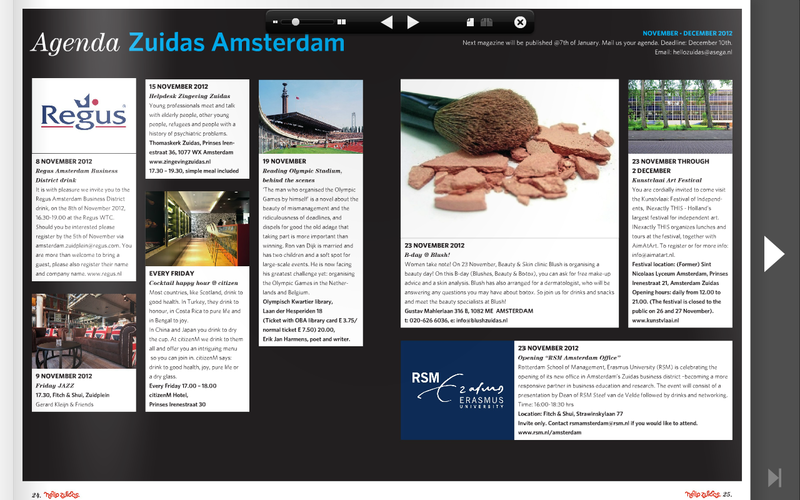 speciale Kunstvlaailunch, entree, Tour AimAtArt & extra entreekaart) via info@aimatart.nl. De Lunch Tours naar de Kunstvlaai worden aangeboden op: woensdag 28, donderdag 29 en vrijdag 30 november van12.00u tot 12.45u en van12.30u tot 13.15u. Verzamelen om 11.55u of 12.25u voor het oude Sint Nicolaas Lyceum, Prinses Irenestraat 21. Vermeld bij je inschrijving op welke dag en tijdstip je meegaat. Er is een maximum van 15 personen per lunchtour. The Kunstvlaai festival is located on a 10 minute bike ride from the Rijksakademie Open (days) which will take place on the 1st and 2nd of December 2012. For more information: click here. "De oude garde fnuikt met gewauwel over vroeger"
"Kunstvlaai 2012 is brimming with joyous creativity"
"The Untold Story. Society at INexactly THIS"
"Kunstvlaai 2012, vervolg eerste ronde"
"De open dagen van experimentele kunstprojecten en ambigue leeszalen"
"Kunstvlaai 2012, een eerste ronde"
"Announcement Kunstvlaai and AimAtArt lunchtours at the Kunstvlaai"
"INexactly THIS, de Kunstvlaai maar dan anders"
"Kunstvlaai kiest voor nomadisch bestaan"
Kunstvlaai: Festival of Independents 2012 ‘INexactly THIS’ could use your support!